How do I get rid of the Win 7 Protection 2013 Alert virus? (I’m writing on my uninfected laptop). I have received the Win7 Protection 2013 Unregistered Version alert, i am sure it is not real but fake AV! As I didn’t install this thing on my work computer and it pops up this morning weirdly. It states this software has blocked a program from accessing the internet, can you help me disable this warning? The Win 7 Protection 2013 Alert virus is an anti-spyware attach that infects the computers of users that carelessly click on links and downloads that contain the virus, or when an email attachment is opened that contains this attack. Like XP Protection 2013, Vista Protection 2013, it comes from the same rogue family. The virus does two things, first it begins to install and attack the system settings, really slowing down the CPU and making normal operations appear to be very sluggish. The second thing this virus does is to display a fake virus scan, which shows the users the results upon completion, alerting them that there has been several threats detected on the computer and they need to be removed and deleted immediately. If the user then instructs the virus scan to delete the infected and dangerous files it will then state that the software is not up to date and needs to be upgraded to the newest version in order for it to work. Obviously this is a fake scan and results, and the hackers are just after one thing, and that is the credit card details of the user. Not only will they charge the user for an “upgrade” that doesn’t really exist, but also they will then have access to their credit card number and can use it to commit additional fraud, or they will sell it to other cyber criminals groups oversea that will then use it to make fraudulent purchases. Regardless of what they do with it, it will not be good and can be very difficult to clean up the mess that they will cause. The scan that the Win 7 Protection 2013 Alert virus displays when the PC is started up looks exactly like a real scan, and the layout is almost an identical copy of the leading virus scanning programs that come standard on the Windows based operating systems. The average user is going to associate the fake scan with the legitimate software and believe the message and “update” by paying the money. They will get scared when they see all of the attacks and threats that the results list and will want to get the system cleaned up quickly, as the upgrade price is a much smaller price to pay rather than having to pay for computer repairs if the viruses attack. How Do You Know If Your Computer has been effected by Win7 Protection 2013 Virus? What happens if Win7 Security 2013 show you a fictitious scan result? It will alert you there are many critical system problems on your computer. Although it looks as it is legit, it also can be picked up by its symptoms of fake alert. 1.Your system becomes a target for spam and bulky, intruding ads. 2. Browser crashes frequently and web access speed decreases. 3. Your personal files, photos, documents and passwords get stolen. 4. Your computer is used for criminal activity behind your back. 5. Bank details and credit card information gets disclosed. What is The Best and Easiest Way to Uninstall This Virus? Ignore any alert that the Win 7 Protection 2013 Alert virus displays, as they are all fake and there isn’t a real threat. The only virus on the computer is the message stating that the computer is infected. The virus must be removed fully in order to make the messages and warnings stop. We provide complete manual removal instructions below to free your PC from the Windowns 7 Protection 2013 Alert virus. 1. Restart your PC before windows launches, tap “F8” constantly. 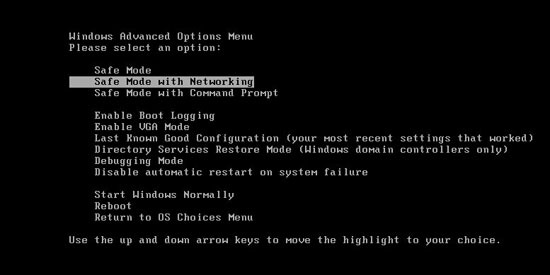 Choose“Safe Mode with Networking” option, and then press Enter key. 2. Press Ctrl+Alt+Del keys together and stop the process in the Windows Task Manager. 5. Reboot the computer to normal mode when the above steps are done. To sum up, you should learn that the Win 7 Protection 2013 Alert virus will disable the Windows task manager along with the registry editor, and many programs will become blocked, such as the real virus scanning software on the computer. Once the virus is picked up by the user it will begin to unpack itself and dig deep within the system files and begin to make the changes to the settings. Any program that contains an .exe extension will trigger a false notification, stating that the file has been compromised and is infected. This is done just to scare the user more, as they hope it is the final piece of their plan that will trigger the user to pull out his or her credit card to pay for the fake upgrade of the software. Manual removal is a complex and risky process, so please consult YooSecurity PC experts 24/7 online to help you uninstall the fake alert from your computer permanently. Note: If you found it difficult to deal with this bad virus, please contact YooCare PC experts 24/7 online will help you remove Win 7 Protection 2013 Virus from your computer completely.